The two or three nightcrawlers and three or four dead rainbow shiners I pinned to a large, circle hook was the most unbelievable gob of bait I’ve ever used. After my Lake Michigan season was finished for 2017 I was off to the Association of Great Lakes Outdoor Writers annual conference at Lake of the Woods, near Baudette, Minnesota. The bait was used on a Lake Sturgeon fishing trip while at the conference. 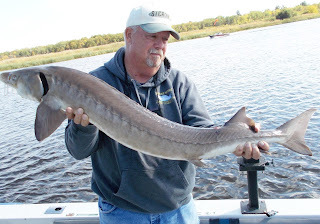 The first “first” was hooking and boating a 48-inch lake sturgeon in the Rainy River, just across from the conference’s host facility, Sportsman’s Lodge. I’d caught a small lake sturgeon a few years ago at the AGLOW conference at Niagara Falls but that one was an accidental catch while we were fishing for salmon in the Devil’s Hole below the falls. It was small and only weighed five or six pounds. I signed up for the sturgeon outing to see if I could hook one on purpose and get one with some girth to it. Sturgeon up to 100 pounds are reported to swim in those waters. It worked. I stuck the first sturgeon (of three sturgeon caught on this four -hour trip) and at 48 inches (measured) and an estimated weight well over 30 pounds it was my largest ever freshwater fish. The second “first” I accomplished that day was because of the large bait we were using, as well. Our group was pestered by small fish nibbling on our bait and stealing the shiners all afternoon. 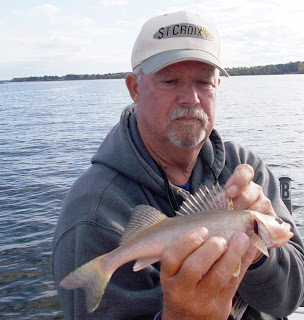 I eventually caught one of the bait stealers, a small sauger. I’ve fished in places with saugers in the past, but I never specifically tried to catch one and hadn’t ever hooked into one. I still haven’t fished specifically for them, so that little guy was my first. My sauger was only about a foot long. That’s not all that large, but about average for that area. The guide said the largest he’d ever measured from Lake of the Woods was just over 19 inches. The rest of the story is better. I owe the catch to the large bait. Somehow, the sauger managed to inhale the entire bait gob and with a mouth rimmed with somewhat inward facing sharp teeth, it couldn’t spit it out as I reeled it up to the boat. The hook wasn’t even stuck in the fish!